I am finally starting to feel better! Still a bit woozy, but better. 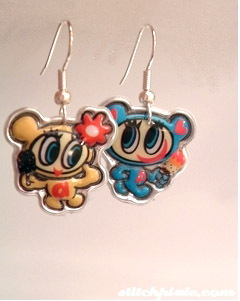 Here are some great earrings from a trade I did with Stitch Pixie. Aren't they cute? You can see more like this on page 7 of her jewellery section. 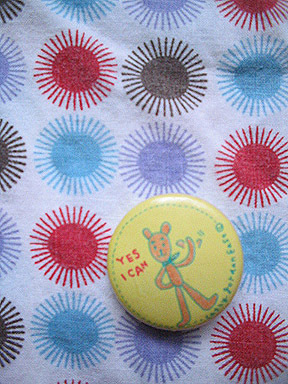 This is a button I have had for years. It was in my wallet until I got a vinyl one that I couldn't stick the pin in. Now it is on my inspiration board. I love it! It's my little mantra. The fabric is some pyjamas I love and I have wanted to post for ages, just so i could look at it often. ooooh i love that fabric from your pj's it reminds me of the emblems for cmyk printing!